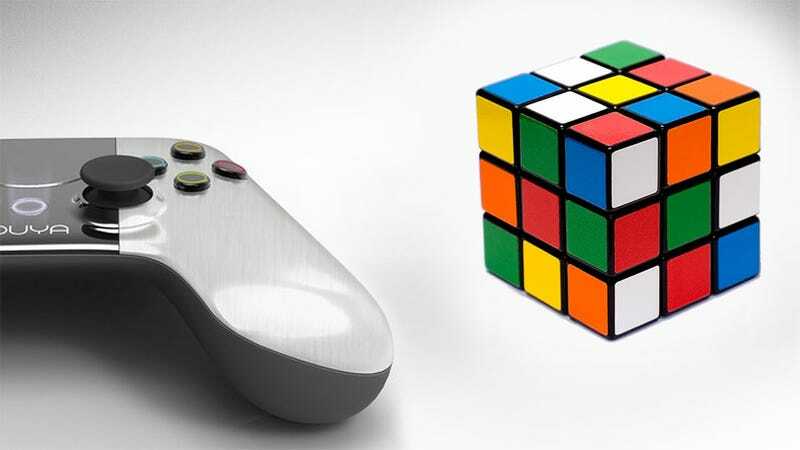 Amidst all the talk of the fancy new Ouya console, and all its promise and possibilities, the more specific, physical aspects of the machine have gone largely unnoticed. Which is weird, because the design of the console itself is the thing I find most interesting. Especially when you consider its size. While looking at press images of the machine would understandably have you thinking it's about the size of Nintendo's old GameCube, the fact is the design team is thinking smaller. A lot smaller. In a chat with Kotaku readers last week, Yves Béhar, the man responsible for designing the exterior of the machine, said "...our console is quite small, around the size of a Rubik's cube, and so it will easily fit anywhere in a room, or be easy to throw in a backpack." While there's no official size requirement for a Rubik's Cube, most versions measure between 3-5 inches wide (and long, and deep...it's a cube, after all). So when Béhar says you could throw it in a bacpack, he's not kidding.